Older workers are increasingly relying on the labor market—rather than savings—to salvage their retirement prospects. The collapse of the financial sector wiped out an inflation-adjusted $2.8 trillion from 401(k)s and individual retirement accounts, or IRA, between September 2007 and December 2008. But even before that, workers were not saving enough to achieve a secure retirement. Millions of elderly workers have therefore been forced to postpone their retirement plans and depend upon work to provide income in their later years. But the labor market is a very mixed bag for older workers. Those who currently have a job have been more effective than their younger counterparts at holding onto their positions in the current downturn; the real value of older workers’ median weekly earnings has grown more during the current recession than that of younger workers; and their unemployment rates—despite reaching record highs—are still considerably lower than the national average. Yet the news is bleak for older workers without a job. Workers 55 and older have a higher unemployment rate than anytime since 1948, and those who are unemployed are staying unemployed much longer. Given employers’ reluctance to start hiring again, it is likely that older workers will have to continue looking for work for months before finding a job. Unemployment among older workers has peaked in the current recession. There has been a 134-percent increase in the number of workers over the age of 55 who are looking for work since December 2007, up from 843,000 to 2.0 million last month. In June 2009, the unemployment level of this age demographic peaked at 2.1 million—a number higher than anytime since 1948 when the Bureau of Labor Statistics began tracking that data. And the oldest workers—those over the age of 65—have also seen their unemployment levels rise, up to 447,000 last month from 197,000 in December 2007—a 127 percent increase. In comparison, prime-aged workers—workers aged 25 to 54—saw their unemployment levels increase by 118 percent over the last 21 months, rising from 4.2 million to 9.1 million in August. 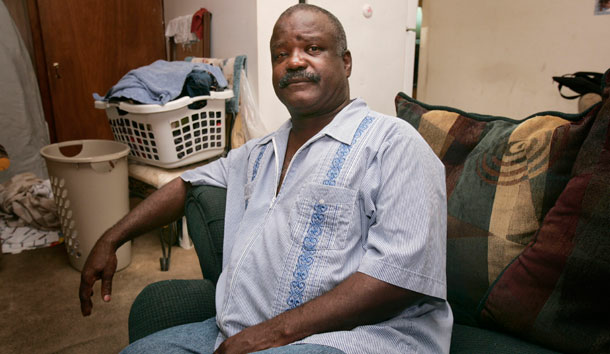 The age-55-and-older unemployment rate climbed to an all-time high in June 2009 of 7.0 percent, 3.9 percentage points higher than at the start of the current recession. This rate inched down to 6.8 percent last month, but that is still extraordinarily high for older workers. Workers 65 and older saw their unemployment rate reach 7.0 percent in July 2009, up 3.7 percentage points since December 2007, and higher than anytime since 1948. Their unemployment rate also inched down in August to 6.8 percent. 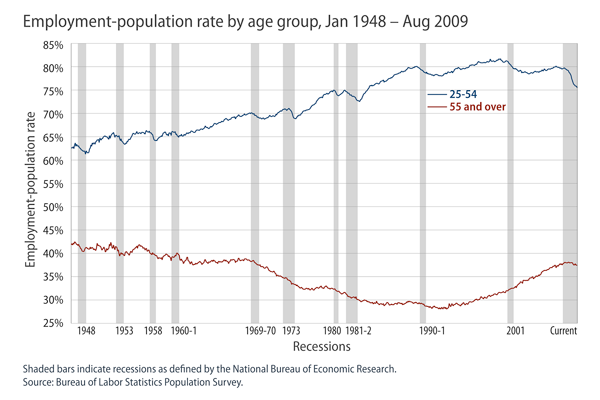 Despite the grim unemployment outlook, older workers have lower unemployment rates than younger workers. The unemployment rate for all workers in August was 9.7 percent, nearly 3 percentage points higher than the rates reached by older workers. 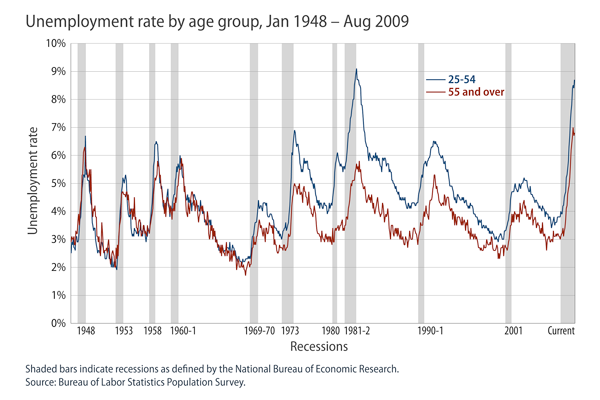 Prime-aged workers—those aged 25 to 54—had an unemployment rate of 8.7 percent in August, up 4.7 percentage points since December 2007, and nearly 2 percentage points higher than the rates reached by older workers. The aging baby boomer generation is reshaping the demographics of the U.S. population, and changing the face of the workforce. People over 55 account for 31 percent of the civilian population today, up from 23 percent in 1948. It is unsurprising then that older workers make up a greater share of the workforce today than any elderly generation of the past. Their employment rate is higher than any time since 1971, and they appear to be holding on to their jobs longer and more effectively than younger workers. A Pew Research Center nationwide survey released yesterday found that a paycheck was not the only factor compelling older workers to remain in the labor force; respondents also cited psychological and social benefits as the main reasons for their continued employment. Younger workers, on the other hand, were found to be staying in school longer to earn a higher degree or have become discouraged at their job prospects and are dropping out of the labor market. The inflow and outflow from the labor market in the last 21 months has shifted the composition of the labor force in favor of elderly workers. The number of workers over the age of 55 in the labor force has grown by 2.1 million since December 2007—an increase of 7.6 percent. The number of prime-aged workers in the labor force has declined by 608,000 over that same time period—a decrease of 0.6 percent. Younger workers have seen the sharpest declines, losing 608,000 labor force participants since December 2007—a decrease of 3.1 percent. Workers 55 and older account for 18.8 percent of the labor force today—up from 17.6 percent at the start of the current economic recession—and higher than anytime since 1948. Their share of the workforce has increased by 7.1 percent over the last 21 months. In comparison, the share of prime-age workers in the workforce has declined 1.1 percent since the start of the Great Recession. Prime-age workers currently account for 67.3 percent of the workforce, down from 68.0 percent 21 months ago. Younger workers aged 16 to 24—whose share of the workforce has declined by 3.6 percent since December 2007—make up 13.9 percent of the workforce, down 0.5 percentage points from December 2007. Elderly workers have experienced net gains in employment in recent months, especially when compared to younger workers. Workers 55 and older have gained 938,000 jobs since the start of the Great Recession, while workers between the age of 25 and 54 have lost a total of 5.5 million jobs. Employment rates for older workers have also reached record levels. 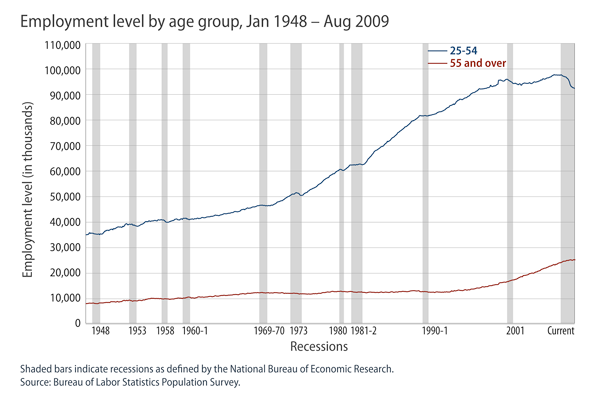 The employed share of workers over 55 climbed to 38.0 percent in the current recession, most recently in August 2008. This is a high not seen since 1970. The employment rate for this segment of the population was 37.3 percent last month, only marginally lower. The employed share of workers over 65 climbed to a record 16.5 percent in the current recession, most recently in October 2008. This is also a record not seen since 1970. And the employment rate for workers over 65 was 16.1 percent last month—down 0.4 percentage points from the current recession’s peak. Older workers have also been relatively effective at holding onto their jobs in the current downturn. The employed share of workers over 55 has only declined 0.4 percentage points since December 2007, compared to a decline of 5.5 percentage points for workers between the ages of 16 and 24, and a decline of 4.2 percentage points for workers between the ages of 25 and 54. Older workers have experienced greater gains in real earnings value than younger workers in the current downturn, providing them with an additional cushion to endure the crisis. The real median weekly earnings for workers 55 and older have increased by 10.3 percent since 2007, and by 5.2 percent since 2008. Workers 65 and older have seen a 23.7 percent increase in real median weekly earnings since 2007, and an 11.2 percent increase since 2008. In contrast, workers aged 16 to 24 have seen their real weekly earnings decline in real value by 2.8 percent since 2007, and by 0.9 percent since 2008. Real weekly earnings of prime-aged workers have increased by a modest 1.7 percent since 2007, and by 2.5 percent since 2008. The Great Recession has decimated the retirement savings of older Americans and placed them in a very precarious position. Working later in life has traditionally been the fall back for those with inadequate retirement savings, but the labor market during the Great Recession isn’t all that great, which makes it a more difficult prospect. Older workers with a job may be doing better than their younger counterparts, but older workers without a job face an unprecedented challenge. Real solutions to this retirement crisis will require getting the labor market back on track and addressing the glaring inadequacies of our current retirement system. David Madland is Director of the American Work Project at the Center for American Progress and Nayla Kazzi is Research Assistant at the Center for American Progress. For more on this topic, please visit our Economy page.